Adapting to change feels just plain wrong, but the market has spoken. It's telling us we have a systematic problem; it's time for a systematic solution. Innovate. If you run a business and you are committed to its long-term growth, then this question is constantly nagging at you. It won't let you get a good night's sleep. It's morning. Before you climb out of bed, you check your smartphone and begin to survey the landscape that is your business day. You get dressed and start thinking about growth - your need for it, your desire to have it. On your way into work, you start to deal with the tactical requirements of the business day. With only so much bandwidth, you need to move the ball on today's tasks. You crank through lunch, and keep the team moving. You deal with vendors, and a couple of unexpected HR issues. As you unwind your business day (closing your laptop at 11 pm), you realize you spent no time thinking about a plan for sustainable, profitable growth. You go to bed with the same nagging question. Sunday rolls around, and maybe you look at the bestseller list of business books in the paper. You ask yourself: 'Which one of these books holds the key to my growth strategy?' While there may be some great takeaways in these books, most speak in broad terms and reference examples that do not apply to you. Monday is coming, and another week slips by without thinking about the larger issues in your business. Again. As business leaders, we find ourselves with these common problems, but our circumstances always seem to be slightly different. If you are trying to build something that will have long-term sustained profits, you are forced to try and make sense of all the inputs you see. The market is telling you one thing. Your suppliers are telling you something else. You wonder how the general economy is impacting you. You talk to your biggest customers. You talk to your newest customers. Nothing seems to stand out to help you answer the question of growth. No one thing will ever completely answer this question, but over the last several years, chunks of knowledge and ideas have proven to help many people create their own answer to the question of sustainable growth. Grant McCracken, a research affiliate with MIT and author of Chief Culture Officer, recently wrote an article talking about how every company should actively work to develop a second operation that does not rely on the primary revenue stream to grow and prosper, or they will fail. His premise is simple: All winners lose. The market leader is a dead man walking. The incumbent is cursed with inevitable failure. The world will change. The reigning corporation will fail to adjust. There is evidence, to be sure. Of the top 25 corporations listed in Fortune in 2000, only 12 were still there in 2010. Let's put this another way: In the first decade of the 21st century, half the winners lost. The structural factors are clear enough. The world is changing more quickly, and black swans1 are multiplying. Disruption is everywhere. The incumbent can end up failing, dazed and confused. Success makes the corporation believe it has things right, so change feels like self-betrayal. The competition forces a new business model. So change feels like a tumult. The new market often forces a move from a premium price position to a commodity one, and change feels like a give-away. Adapting to change feels just plain wrong, but the market has spoken. It's telling us we have a systematic problem; it's time for a systematic solution. We cannot nickel and dime our way out of this one. We need a big, bold answer. Assuming, that is, that we want to escape the curse of the incumbent. McCracken's version of this answer is to build a second corporation, and wrap it around the first. Now there are two. The first corporation is defined pretty much as it is now. And the second corporation is another creature altogether, with a different set of principles and processes. The first corporation exists to win. It exists to find, extract and capture available value. Leave this just as it is. But let's acknowledge that this first corporation exposes us to risk. After all, it is designed to work with the world as is current. It must be out of alignment with the worlds that may be. It makes us a prisoner of the moment. The second corporation is looking for those worlds that may be. Its task is not to win, but to survive. It's counter-intuitive, and we can hear you arguing: "Winning, surviving; this is a distinction without a difference!" But look at it this way - if winning (and the first corporation) were enough, we wouldn't see half the winners on top of the Fortune 500 fall like Icarus. If winning were enough, surviving would take care of itself. But it turns out, winning and surviving are different things. They take different mindsets. They take a different set of systems and instincts. The corporation should stop struggling to win. It should keep hiring the best people, finding the best partners, devising the best strategies, squeezing out costs, innovating faster and smarter, clobbering the competition, etc. Winning is the deepest part of its DNA. McCracken says we need a bridge from which to spot those black swans. We need a way to prepare for worlds that are implausible. Everyone knows that we live in a world of tremendous change. Our response has been what Andy Grove calls building a better firehouse. We are committed to getting faster and more agile, but there's an absolute limit to how fast we can get. Many corporations run pretty good firehouses as it is. They can't get a lot faster. The world doesn't care. It's going to get much, much faster. Time to rebuild the firehouse. Time to rethink firefighting. McCracken goes on to describe the turbulence. As the world gets more turbulent, the organization gets harder to "fly." What used to be simple acts of navigation now contain a lot of guesswork. Simple acts of decision-making are no longer straightforward. Once as easy to fly as a 747 in light chop, the corporation can now feel like a Piper Cub in high winds. There are moments when the instruments go out, and decision-making takes on a "hope and pray" quality. Now that the smart money assumes impending demise, we need a system to ensure our survival. We need something that looks less like improvisation and more like engineering. We need a second corporation. Challenge yourself to create uncontested market space, and make competition irrelevant. In today's overcrowded industries, most companies fight long and hard for competitive advantage; battle for market share; and struggle for differentiation, only to find themselves fighting their rivals head-on in a bloody "red ocean" over a shrinking pool of profit. These red ocean strategies are less and less likely to create profitable growth in the future. Blue Ocean Strategy argues (correctly) that tomorrow's leading companies will succeed not by battling competitors, but by creating "blue oceans" of uncontested market space, ripe for growth. Such strategic moves - termed "value innovation" - create powerful leaps in value for both the firm and its buyers, rendering rivals obsolete and unleashing new demand. Do you think this does not apply to us? That would be incorrect. Digital direct-to-garment printers have created a whole new market for mass customized apparel. Café Press, Zazzle and a very few others saw this and used the technology advances to create a 'blue ocean' of minimized competition and higher per-shirt profits. Businesses that actively pursue innovation generate more growth and profits than those that do not. They enjoy higher margins and brand awareness. Innovation can come from anywhere or anyone, inside or outside the company. You must build time for innovation, or it will not happen. It must be part of the mandate, or it will not happen. Ask yourself this question: Who on your team would rank 'developing innovative ideas' as one of their top three duties? 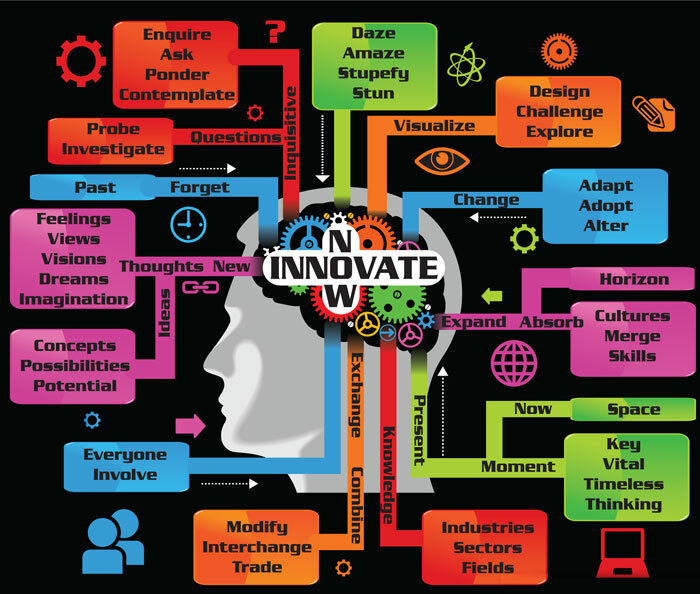 But how do you innovate? You must look for problems that need solving. Understanding the trends and drivers in your industry are critical for success. You can identify the value chain, and compete in it differently. You can look at your customers in a different way. What outcomes do they want to achieve? Can you increase revenue by helping them do that in a different way? In the end, if you want to increase margins, you need to develop new products, services and processes. The most critical thing you must do as a leader is to foster a culture of innovation. You must welcome new ideas. You must ask your employees what they see customers wanting. Have a system for suggestions that is interactive. Not a box on a wall called 'Suggestions'. Engage your employees in different activities to spur new ideas. If you are afraid to think big, you will never harness innovations potential. Upon his arrival from Omega Watches, Biver set about creating a new flagship collection that was unveiled in Basel, Switzerland, in April 2005, with the Hublot "Big Bang" chronograph. It was an immediate success, and orders increased threefold in one year. A few months later, in November 2005, the Big Bang chronograph was awarded internationally, receiving the "2005 Design Prize" in the "Geneva Watchmaking Grand Prix"; the "Sports Watch Prize" at the "Watch of the Year" ceremony in Japan; and the Middle Eastern prize for the "Best Oversized Watch" at the Editor's Choice "Watch of the Year" in Bahrain. Following the arrival of Biver in 2004, the brand's sales hit 24 million Swiss francs, and by the end of 2006, sales were bordering on the 100 million Swiss franc mark. Innovation can happen in any product area. Even in an industry as old as watch making, innovation happens. The first wristwatch was made in 1868. Hublot CEO Jean-Claude Biver knows that innovation and making the right kind of noise are his keys for growth. The company, which sells watches with price tags ranging from a couple thousand dollars to a couple million, says it has a plan. Hublot currently holds a patent for ‘Magic Gold', a scratch-resistant gold used in its watches. The company continues to look for new ways to innovate, separating itself from its competitors. 'In a time of crisis, this type of product is so much different, so revolutionary and so unique that people, if they buy a gold watch, will come and buy our gold watch. As soon as you are in crisis, innovation is key,' Biver said. 1The black swan theory is a metaphor that describes an event that is a surprise (to the observer), has a major impact, and after the fact, is often inappropriately rationalized with the benefit of hindsight. Author's note: The ideas expressed in this article have played a significant role at our company for the last several years. They helped sustain double-digit growth rates through a challenging economic cycle, and have caused innovation to be a focal point going forward. They are offered for your consideration. All of these 'big thoughts' have been in the data stream for a while. The author did not come up with these concepts, though hopefully they can help you chart your company's path. This industry is desperately seeking that next compelling leap forward in technology. As the digital innovations of the last several years begin to flatten out, who will be the next Black Swan? Will you be the next creative disrupter? It is something we should all aspire to be. This article appeared in the SGIA Journal, September/October 2012 Issue and is reprinted with permission. Copyright 2013 Specialty Graphic Imaging Association (www.sgia.org). All Rights Reserved.